You notice that your asthma symptoms and/or attacks have gotten worse and/or more persistent. You may have also noticed that your overall asthma symptoms have increased, that you are experiencing more asthma attacks, and/or that your asthma condition is more problematic overall than normal. You have noticed a connection between your anxious and/or stress and an increase in asthma symptoms and/or attacks. Many find their asthma symptoms increase more in the early morning and/or at night. Asthma attacks, however, can occur at any time and can be triggered by a number of factors. Asthma is caused by a narrowing and swelling of the airways, which can also cause a production of mucus that makes it difficult to breathe. Some medical sources have linked the swelling of airways to inflammation, which can be triggered by an overly sensitive/reactive immune system. Because stress negatively impacts the body’s immune system, stress can play a role in the degree and prevalence of asthma. “During periods of stress and anxiety, asthma attacks occur more frequently, and asthma control is more difficult.” - Peter Gergen, MP, MPH, a senior medical officer at the National Institute of Allergy and Infectious Diseases. 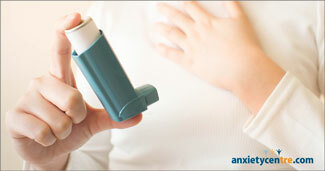 Why does anxiety aggravate asthma symptoms and attacks? At this time, the cause of asthma is unknown. Many sources suggest there is a combination of factors that cause asthma, such as environmental and genetic. But the condition of asthma is well understood. “Asthma is an inflammatory disease of the airways,” says Bradley Chipps, MD, pediatric pulmonologist and allergist in Sacramento, California. Even though the cause of asthma is unknown, there are many aggravators and triggers of asthma symptoms and attacks, including as mentioned above, stress. Anxiety is also linked as an asthma aggravator because of how behaving anxiously affects the body. Behaving in an apprehensive manner (worried, fretful, fearful, nervous) causes the body to activate the stress response. The stress response secretes stress hormones into the bloodstream where they travel to targeted spots in the body to bring about specific physiological, psychological, and emotional changes that enhance the body’s ability to deal with a threat—to either fight with or flee from it—which is the reason the stress response is often referred to as the fight or flight response. These stress response changes push the body past its normal operating balance, and therefore, stress the body. So stress and anxiety-caused stress can aggravate asthma, asthma symptoms, and asthma attacks. How can I reduce my asthma symptoms and attacks? Due to the connection between asthma, stress, and anxiety caused stress, asthma symptoms and attacks can be reduced by reducing stress and learning to better manage your anxious behaviors. And so on, can all help reduce stress. The most important, however, is addressing the underlying factors that motivate your anxious behaviors so that your body’s stress CAN diminish sufficiently (continued stress responses triggered by unidentified and unresolved underlying anxiety factors can prevent meaningful stress reduction). Behaving less anxiously, reducing your body’s stress, and giving your body ample time to respond will bring about the desired stress reduction effects over time. As your body calms down and recovers from its overly stressed state, it could reduce your susceptibility to asthma and its symptoms and attacks, if stress is a major cause of your asthma symptoms and attacks. Unfortunately, there are NO quick-fix cures for stress reduction. Reducing stress takes time, and more time than most people think. Because worrying, fretting, and becoming emotionally upset stress the body, these types of behaviors can interfere with the stress reduction process. How do I cope with anxiety during an asthma attack? Asthma can cause a shortness of breath. Being short of breath can trigger an involuntary panic attack, as well as a voluntary panic attack if you believe your survival is at risk. You can remedy this by having rescue medication available, understanding how long it takes for your medication to work, knowing when to seek emergency help, and by calming yourself down. It’s also helpful to make an ‘action plan’ ahead of time so that you don’t have to try and figure things out during an asthma attack. If you are concerned that asthma may prevent you from living a normal life, you may want to talk with an anxiety disorder therapist to help you address this concern as well as help you devise strategies on how to best manage asthma while living a normal life. The combination of stress management, learning to behave less anxiously, and managing asthma well could allow you to live a normal life without any unnecessary restrictions. When asthma is managed well, “Self-limiting isn’t really necessary,” says Gergen. For more information about involuntary and voluntary panic attacks, the stress response, stress-response hyperstimulation, and additional recovery strategies and tips, we have many chapters that address this information in the Recovery Support area of our website. Return to our section that explains the hundreds of anxiety signs and symptoms, including trembling, numbness, tingling, shortness or breath, and racing heart, and so on. anxietycentre.com: Information, support, and coaching/therapy for problematic anxiety and its sensations and symptoms, including how anxiety affects asthma.